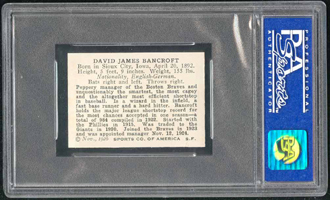 One of the best fielding shortstops of all time, Bancroft set a major league record in 1922 when he handled 984 chances. 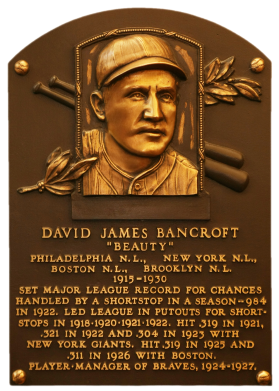 A heady ballplayer, "Beauty" was named captain of the Giants in 1920 and led them to four straight pennants. He batted over .300 five times in his career. Comments: BMW Sportscards supplied me with this card in July, 2004. Brian was kind enough to include the original envelope and script coupon as part of the deal. In December, 2004 I picked up a potential replacement. David Bryan sold me a D381 Fleischmann Bakery SGC 40 of Bancroft - great card, sweet image. I really wanted a HOFer from the amazing set but also really liked the '26 Spalding card. With my dilemma, I kept both for a few months until I found another D381 HOFer, a Walter Maranville also graded SGC 40. 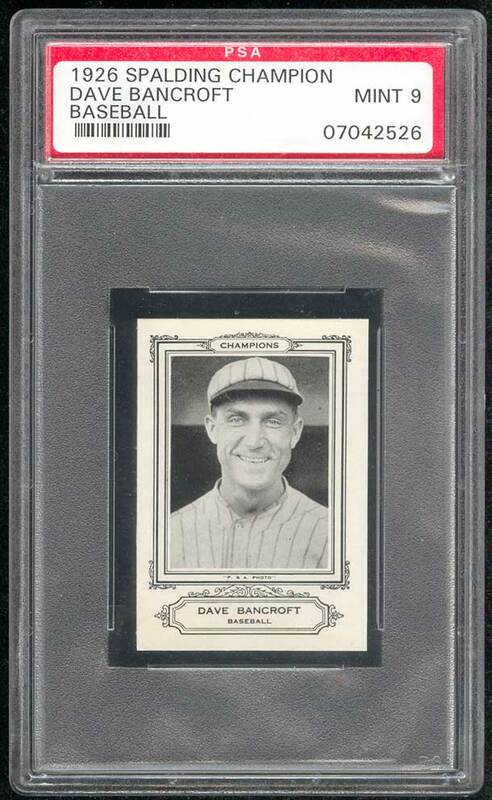 That allowed me to sell the Bakery Bancroft, keep the '26 Spalding card and also have a D381 represented in the collection by Maranville. Win, win, win! Little was known of these small (1-1/2" X 2-1/4") black-and-white cards until an original store display was discovered in the late 1980s. 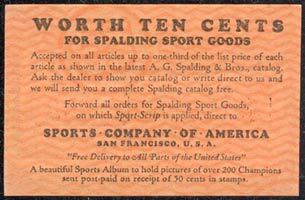 Carrying a copyright date of Nov., 1926 from Sports Co. of America, a San Francisco publishing firm, these cards were produced for A.G. Spalding & Bros., the sporting goods firm. 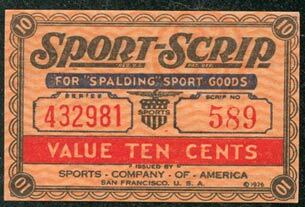 Each card was issued in a wax paper baggie with a small like-sized red, white, and blue "Sports-Scrip" which was serial numbered for use in a candy prize drawing at the store or could be redeemed for 10 cents on Spalding equipment. 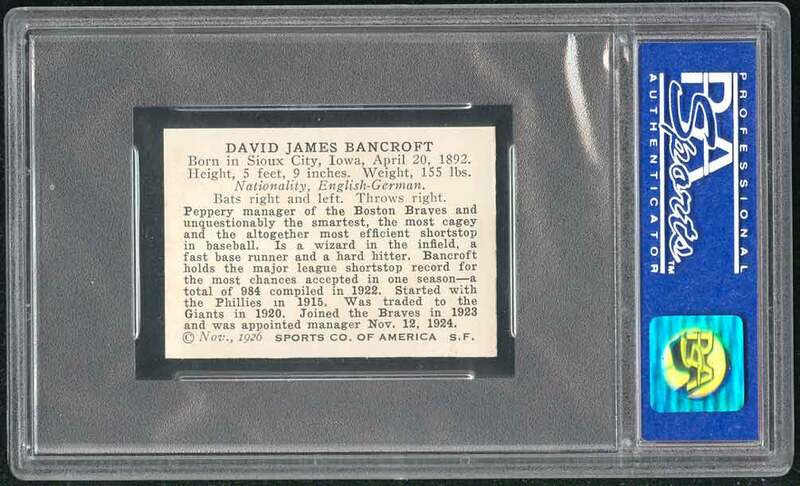 The cards themselves feature ornately framed photos at center, with "CHAMPIONS" in a cartouche at top and the player's name and sport in a second ornate frame at bottom. Most backs have biographical data and career notes, but some are seen with advertising offering an album for the pieces. 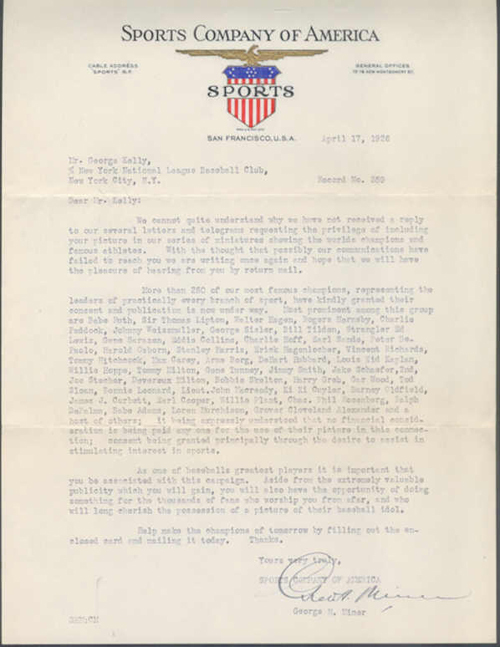 Nearly 50 baseball players are known from a list of 175 male and female athletes from sports as diverse as fishing, chess and balloon racing.